In recent decades, historians and social theorists have given much thought to the concept of "culture," its origins in Western thought, and its usefulness for social analysis. 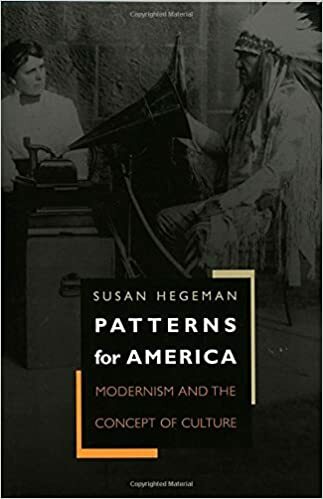 In this book, Susan Hegeman focuses on the term's history in the United States in the first half of the twentieth century. She shows how, during this period, the term "culture" changed from being a technical term associated primarily with anthropology into a term of popular usage. She shows the connections between this movement of "culture" into the mainstream and the emergence of a distinctive "American culture," with its own patterns, values, and beliefs. Hegeman points to the significant similarities between the conceptions of culture produced by anthropologists Franz Boas, Edward Sapir, Ruth Benedict, and Margaret Mead, and a diversity of other intellectuals, including Randolph Bourne, Van Wyck Brooks, Waldo Frank, and Dwight Macdonald. Hegeman reveals how relativist anthropological ideas of human culture--which stressed the distance between modern centers and "primitive" peripheries--came into alliance with the evaluating judgments of artists and critics. This anthropological conception provided a spatial awareness that helped develop the notion of a specifically American "culture." She also shows the connections between this new view of "culture" and the artistic work of the period by, among others, Sherwood Anderson, Jean Toomer, Thomas Hart Benton, Nathanael West, and James Agee and depicts in a new way the richness and complexity of the modernist milieu in the United States. brethren, he was able to attain them. He had the genius for transferring them, when they encountered obstacles in life, to some other but still real plane. And I say real, because the Jew never lost the objective balance, never leaped up in the transcendental escape. The plane to which he lifted his needs was ever one upon which his emotions, instincts, experience, and activity of life could remain in play. If he was persecuted and despised, he found his sense of power in his religious mission.